Is the Apple Store down right now, or are you trying to watch a live event and the video stream has problems? Normally, the online retail location for Apple will stop working just before new products release, which come shortly after an Apple event in most circumstances, although on occasion they will run into problems or unplanned maintenance. In the majority of circumstances, if the Apple Store is down today it’s likely on an event day. Our readers can leave their status reports for the Apple Store below, or take a look at others with locations where the online store is currently not working in. You can also access support from Apple via the contact details shared to the right of this page. These sources include social accounts, official product forums, and more. We’d also love to hear about live stream problems in the reports section, especially during an event day when the demand means things might not be working like they should. If Apple Store and Website is down today, then reports will be found below. I am trying to login to my Apple account so I can purchase a product but it keeps saying password in incorrect. Keeps asking me to reset it. All devices seems to be having trouble when i try to sign in to my itunes etc. I put in my username and password and it keeps saying its incorrect. I have tried on multiple devices such as iPhone, iPad and desktop and still not letting me in. Today is Apple iPhone 7 event date, yes September 7, 2016. Wonder if the store will go down for them to highlight the new phone. When will be able to buy the iPhone 7 on the Apple Store? My apps are downloading over and over again when they are basically on and endless download look. I went to the Apple Store to download a new app and it will not recognise my password, this is just a pain in the rear end. I have tried to download the latest Mac OS which is OS X Yosemite, but for some reason its not happening for me, it says its unavailable. I would like to save money in one respect, but in the other i would rather Apple did not do any Black Friday deals because it will just slow everything up immensely. I had my iPhone 6S Space Gray buying page already open on the Apple Store, and i click refresh this morning and now its offline. 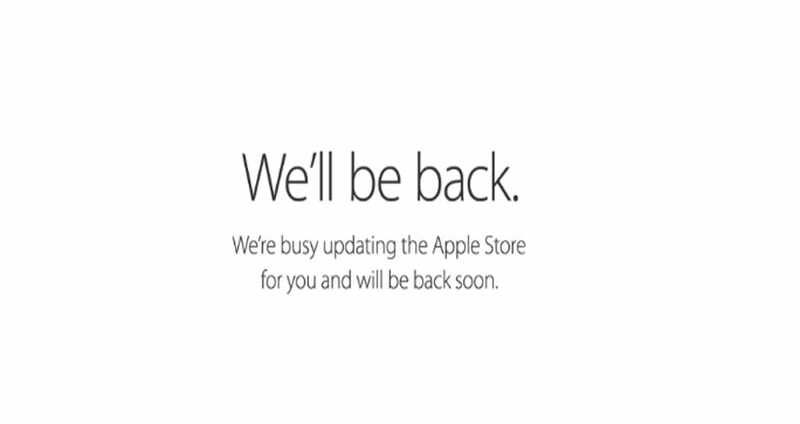 The Apple Store is down right now on September 12, and we know this is simply to do with the new 2015 iPhones. If the Apple Store is down does this mean they will be adding new products today? Maybe we will be able to see the new Apple TV pre-order form on the Store when it comes back online. Apple Store is down, this is normal seeing as the Apple Event is going to start in just over 2 hours time. People are saying there could be a design change with the new iPhone, but i just think it will be a simple iPhone 6S and 6S Plus. Even siri doesnt know what the Apple event is about tonight. When asked he said chicken crossed the road. The Apple event live stream will no doubt go down today because of the over load. Still looking forward to it though. When is the next Apple event stream happening and what for? Had issue opening store this morning, but found it was due to no Internet service my end. Virgin Media playing up again. I want to remove the apple watch app I just got after installing the latest update on my iPhone 6, it won’t let me uninstall, even when I hold down on the icon, there’s no X to uninstall. How do you delete the Apple watch app that is now installed after I updated to iOS 8,2? I want to remove it. When will the live streaming start at apple’s live page? The status page has a counter for how long the store has been done, it went down at 12 noon Uk time, so been down just over 1.5 hours now. Seeing the store is down, NY. Normally outage message, back soon etc. Store is down in the UK. The Apple store has gone down, March 9, pre-order for Watch? Hope so. what time will the event be today in France, or the UK? No matter how big a company is, every website has a limit to how much traffic it can handle and this event includes Apple’s live streaming. If the apple event stream goes down today, let’s just say it will be a major flop for a company of this size. We won’t be able to preorder the apple watch just yet, I know some people will be looking for that after the keynote today. I really hope the store updates today with a pre-order for Apple’s Watch. Cant see the apple special event logo on my apple tv, when should it appear. The Apple watch is revealed today once again at an event starting 10AM, PST. I found the live stream on apple’s website, just hope it works this time around. I can’t get the Apple Store to load, although I am not seeing the normal store is down message, so guess this is something else. When is the Apple Watch coming out, still waiting for a release date? Can’t get access to my Apple iCloud account. Saying my password isn’t working. Saying I can reset password by having an email sent to my email address – which is my iCloud email – Catch 22 and very frustrating. Apple online store is not working in kent, uk. I can see why now, it’s event day. I really hope Apple finally deliver a new 4th generation iPod touch, been too long and in fact that was Apple’s invite message. Just seen the online Apple Store is down today, now is it just for new iPads or the 4th generation Apple TV as well? Cant wait to find out. The Apple Store is down in the UK, just before the Oct 16th iPad event.